Yesterday we received a letter from the INS. 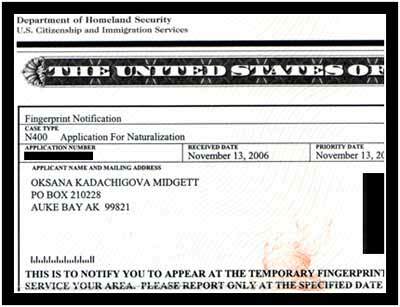 Back in November, after four years of marriage, the INS finally allowed Oksana to apply for U.S. citizenship. She spent a number of hours filling out applications, gathering supporting documents, and writing checks for something like $400 in form filing fees. Then we packaged it all up in a manilla envelope and mailed it off to Nebraska. A month or so later, we received a nice form letter in the mail. “Thank you for applying for ___U.S. Citizenship___. You can expect to hear from us within __365___ days. Don’t call us, we’ll call you.” The wording was different, but that was the exact message, honest. We resolved ourselves to a long wait. So yesterday, when an official envelope arrived, I thought it was going to be time for Oksana to start reading up on the Civil War. After scanning the letter (which, by the way, curiously uses design elements cribbed from our currency), however, I realized that it was just notifying us that she had to get fingerprinted. Again. I don’t know how many times she’s been fingerprinted for this naturalization process. This might be the third time. I have a question: Isn’t one of the reasons we use fingerprints as a form of identification because THEY DON’T CHANGE? What are they hoping to accomplish here? But, hey. Someday it’ll be cool. 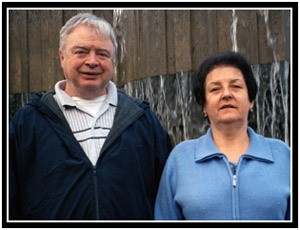 Oksana will be able to vote for the president, get a federal job, or whatever. I’m just looking forward to the day when we can both travel under the same passport.